There's something about pregnancy that makes me want to run. 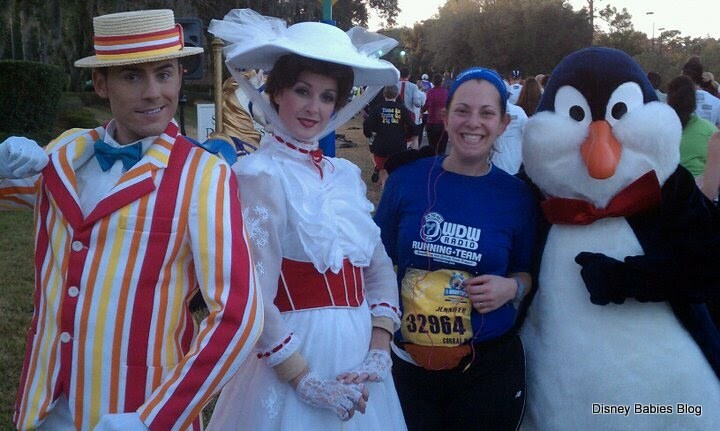 It was during my first pregnancy that I decided to start running distances - when we signed up for the Walt Disney World Half Marathon, which we completed in January of 2011 (my son was 13 months old - I ran my first 13.1 miles). I actually wrote an overview about Marathon Weekend a while back for another Special Edition of the Magical Blogorail. But, that was more about the full weekend, not just the races. This past January, 6 months pregnant, I "ran" the 5k and cheered on my husband, friends, and other runners in the half marathon - a completely different experience than my Marathon Weekend 2011 experience, but still amazing. I met Mary Poppins, Bert, and a Penguin outside of the Grand Floridian! Family Festival Kid's Races (Friday/Saturday) - for crawlers on up, there are races from the 50 meter diaper dash all up to a 1 mile race. They have DJ's and entertainers - in true Disney Fashion - entertaining the masses! 5k - 3.1 miles (Friday, early a.m.) Themed differently every year - 2011 it was Buzz and Woody and Friends, 2012 it was the Three Caballeros. This event literally leads you through the World Showcase and Future World - in and out of EPCOT. This event is not officially timed - there are clocks around so you can figure out your own time, but no time chips or anything to worry about. Characters are set up for photo ops throughout the parks - lines move fairly quickly, but without thinking about time, we stopped and didn't even worry about it! Half Marathon - 13.1 miles (Saturday, early a.m.) - Be warned - for this event, you must be at the Epcot parking lot before 5 a.m. - in your corral (starting place) by 5. The race starts behind Epcot, leads you towards the Magic Kingdom - passing through the Ticket and Transportation Center - inside the Magic Kingdom - running down Main Street, U.S.A., through Fantasyland, through Cinderella Castle and back out on the streets, headed back towards Epcot. You enter Epcot and do a quick tour of Future World before exiting to complete the race. Exhilarating barely begins to explain this! Full Marathon - 26.2 miles (Sunday, early a.m.) - starts at the same place in Epcot, but instead of just running through the Magic Kingdom, you run through all four theme parks. (I can't tell you the exact route, because I haven't taken this challenge yet!). Fast Passes are often available for some of the major attractions, such as Tower of Terror and Expedition Everest. The parks are open and running by the time many runners reach these points, and I've seen many attraction pictures with runners wearing their race bibs! Goofy Challenge - 500 started this challenge the first year and in 2012 there were around 5,000 runners. This challenge - run the Half Marathon Saturday and finish up running the Full Marathon on Sunday. On top of the individual medals you receive for completing the half (Donald) and full (Mickey), you receive a 3rd medal (Goofy) for completing both the same weekend. Dopey Challenge - This is unofficial - but Dopey runners complete the Goofy as well as adding the 5k the Friday before. Though there are many race weekends at the Disney resorts, this weekend is the most popular - over 20,000 people run in each of the big races. The Christmas lights are still up through the weekend, so you can still see all decorations throughout the theme parks. And, if you hang out for a few days after, you'll be pleasantly surprised by one of the most empty times of year. I love marathon weekend! Marathon Weekend 2011 - medals and all, no wait to meet Mickey Mouse! If you're thinking about running, please consider joining some fellow blogorailers and myself to raise money for Autism Speaks - a great organization trying to bring awareness and find a cause/cure for Autism. We'll be setting a small minimum for donations and then cost for a t-shirt, but we would love to have more friendly faces join our team! Check us out on facebook! Great info Jenn!! Thanks for sharing!! :( I so wish I could run this with all of you in January, but I highly doubt I can train and be ready 3 1/2 months after the baby is born!! Great info about the weekend! Thanks for the great info! I'm doing my first race this year (the Disneyland Half). I'm hoping it turns into a passion and gets me out to Florida so I can do the coast I coast challenge!